"There are as many uses for the coconut as there are day in the year" - Indonesian proverb. Coconut oil was the first product that I was introduced for haircare. My mom and grandma swears by it so, there is always a bottle of Parachute Coconut Oil in my home. For summers, we used to get the bottles and in winters, the dubba ones. But use of coconut oil was restricted only to hair. My thoughts changed when I visited Kerala in summer 2008. We halted at our friend house in Thrissur and her Mom handed us a bottle of coconut oil to massage. That was the first time I used coconut oil for skin and immediately realized its moisturizing. purifying and stress relieving effects (We reached Kerala right after 5 days of exams by a 3 days train journey!!). Now, I know the scientific reason behind it. 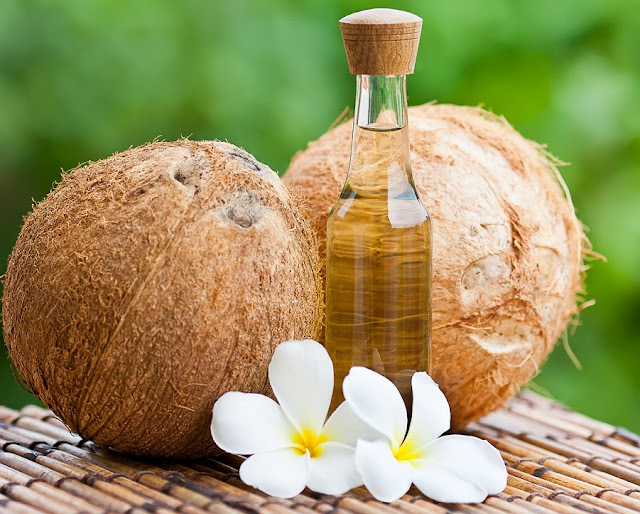 Effective Antibiotic - Renowned Dr. Oz recommends for coconut oil because it contains lauric acid because human body converts lauric acid into monolaurin. Monolaurin helps in dealing with viruses and bacteria. Fights Fungus - Another fatty acid present in coconut is Caprylic acid. Its shape allows it to diffuse into the cell membrane before dissolving it. This unique mechanism makes it a very effective anti fungal and hence, preferred by all medical practitioners for many skin disorders like psoriasis, dermatitis, eczema. Yes, you can even use it for itchy private parts because coconut oil have no side effects. Fatty Moisturizer - One can use it in their everyday routine for skin as a natural moisturizer because it is absorbs very easily by skin because of its molecular structure (medium-chain fatty acids MCFA). This is why our scalp absorbs it more than any other oil. Potent Antioxidant – Coconut is rich in ferulic acid and p-coumaric acid. Both are potent antioxidants that fight free radicals. What free radicals? Well, they are nasty groups of atoms which damage cell components because of which cells may die or function incorrectly. In sort, they are the main reason for aging symptoms and even cancer. Age Repair – Because of antioxidants and ease of absorbing, it makes skin resilient and hence delaying sagging and wrinkles. It also helps to restore the skin damage and sun burn done by sun rays. How you can use it daily? I personally feel that you should use it as bath oil. Other ways to use it is using it as a oil cleanser. Massage a tea spoon on oil. It will dissolve away makeup, dirt and pollution. A bit of it will also be absorbed by your skin providing enough moisturizing effect and also preventing wrinkles acne due to bacteria/fungus and remove dark circles. Oily skin and afraid of oil for skin? Why not try products which contain coconut oil? Parachute along with coconut oil also has a range of moisturizer that is rich in coconut oil - Parachute Advansed Deep Nourish Body Lotion. I checked and found that the 3rd ingredient in coconut oil. I am Pleased. Well, they also have a light summer version - Parachute Advanced Summer Fresh Body Lotion which has a light and minty flavor. Coconut oil is not just amazing for your hair but also for your skin. This post contains the actual reason why it is such a blessing for your skin and how you can harness all the benefits everyday.